SPRING is here, y’all! I know I’ve been whiny and complaining about the nasty cold weather, rainy whatever, so I’m here to celebrate the 80 degree days that we have been having in Nashville by popping a few bottles into my glass as well as the fryer. Why not, right? Around here, you can fry just about anything. Why not include your booze in the picture?! Turns out, this works beautifully. I often will batter and fry fish that we get from the lakes here during the summer with a splash of club soda to give it a great crispy lightness. The carbonation adds much needed air to the batter and keeps it from being super heavy like fried food can often be. 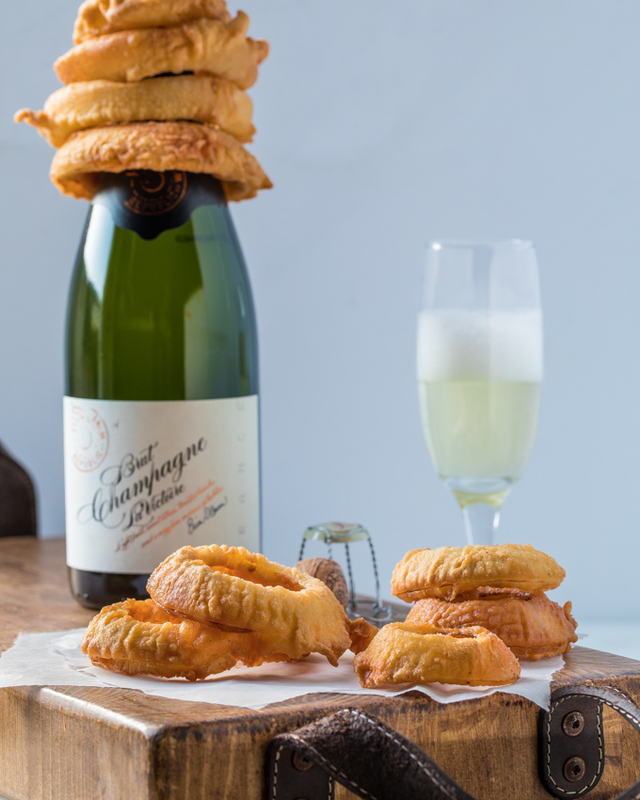 Sadly, the alcohol cooks out, but you are still left with Champagne fizzles and dreams with this recipe. PS — I dunno if anyone is going to follow me on this one, but do any of you remember when Heather Dubrow and Terry had that big blow out about onion rings at their party on RHOC a while back? This is the solution! Champs and rings. ChampRings™! I’m gonna be rich. All of you go tell Bravo that they should come film immediately. I’ve done it. People love to combine beer and a fryer, so I was kinda surprised to kind out with a bit of research that this wasn’t more common. I will say that the flavor that you get from this compared to a beer batter is more mild and subdue, but it’s still delicious. I have some big plans for this combo on the to-do list now. You could do this with leftover bubbly bottle, if such a thing actually exists, I think. I paired the batter with Vidalia onions, because I was raised right and know that it’s the only way to do things here in the South. Be sure you make these thick. 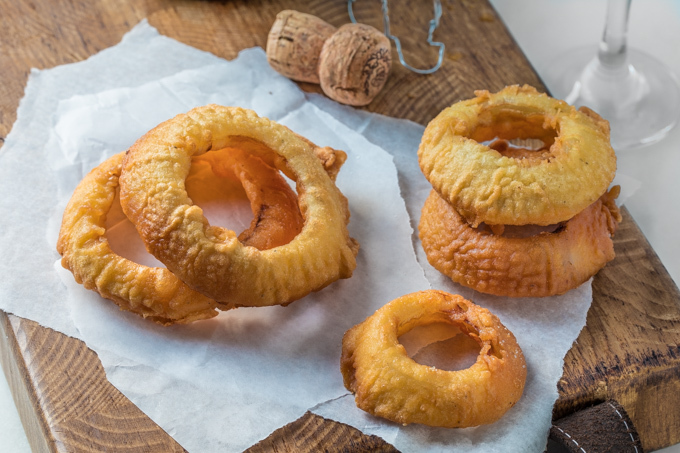 Like a Chef, you don’t ever want to trust a skinny onion ring. Bubble up those rings and be sure to invite me over for the party. 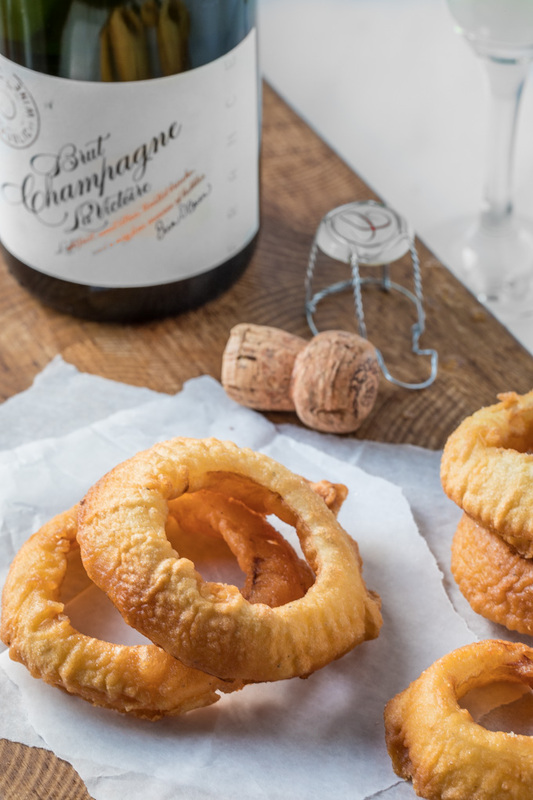 Champagne battered fried onion rings recipe from Southern Fatty. Heat deep fryer oil to 350 F.
Cut onions into large ¾ to 1 inch slices. Take apart and set aside. 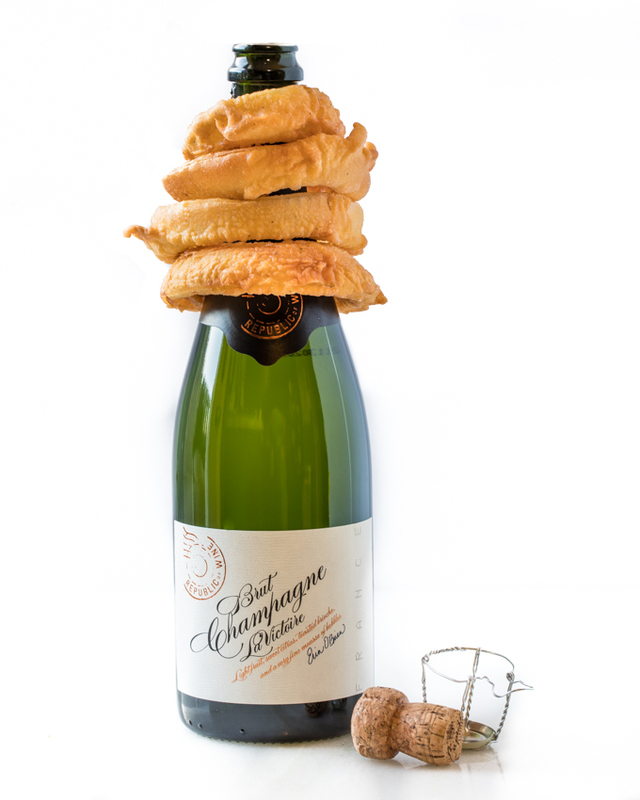 Slowly whisk in Champagne until you have a fluid batter. It should still be a bit thick but run well. Place flour and a bit of salt and pepper in a bowl. Dredge the onion rings in the flour mix, shake off excess well. 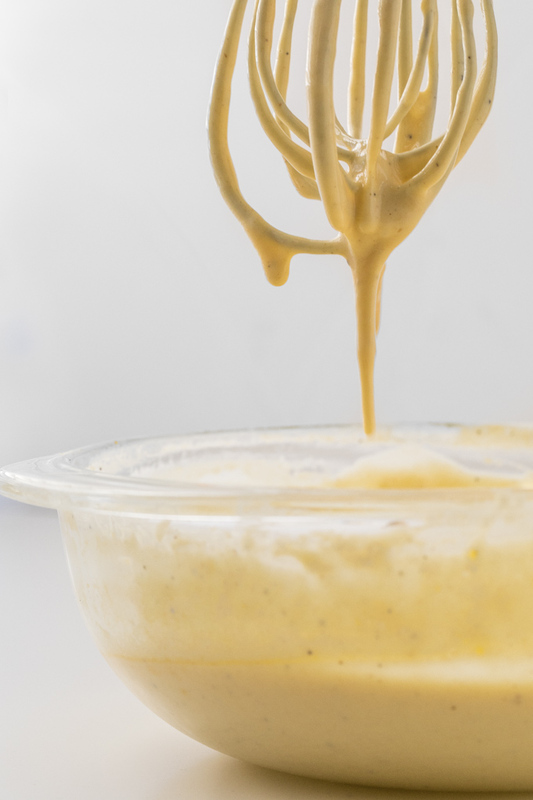 Dip into batter, covering completely. Let excess drop off. Fry in small batched until golden, about 5 minutes. Cool on paper towels and salt. Enjoy with a glass of champs! 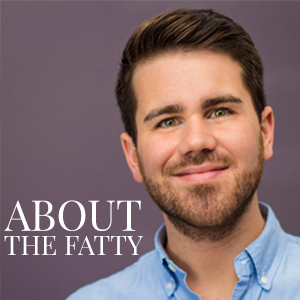 Click HERE to check out our other booze-infused bites! I’m hosting Octoberfest party at my place. 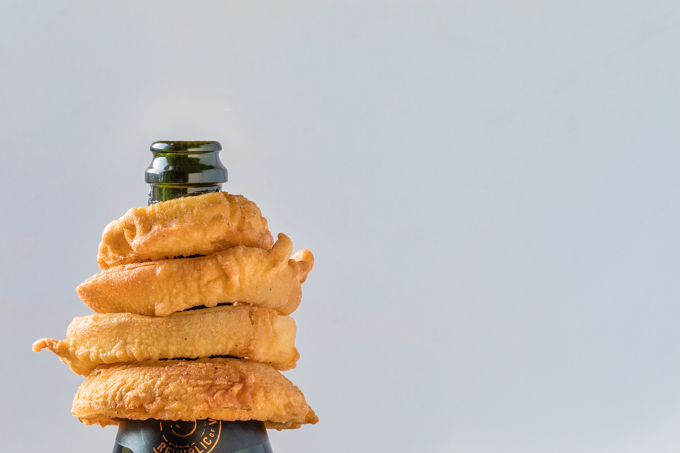 So my question is there any chance I can replace champagne with… beer? At least once. Absolutely! I’ve done it several times. It’s still just as amazing. Enjoy! Never has a bottle of champs looked more enticing. The boyfriend demands I give this a try. Thanks, Phillip! I was so happy with myself when it worked out so well. Enjoy it! Whaaaaat! This is so brilliant! Pinned and sharing! Can’t wait to try.